The 36-year-old havildar displayed raw courage, unflinching grit during his encounter with the terrorists in which he was fatally injured. 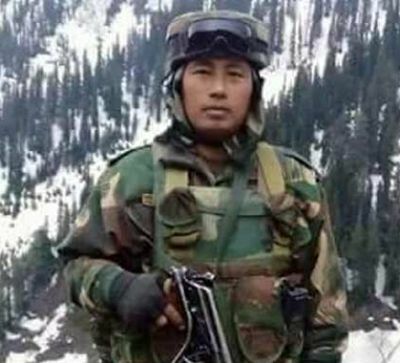 Havildar Hangpan Dada, who killed four intruding terrorists before laying down his life at a height of 13,000 feet in the harsh and icy Himalayan range of North Kashmir, has been bestowed with Ashok Chakra, the country’s highest peace-time army award. Dada 36, was honoured posthumously with the government announcing the award on Sunday on the eve of 70th Independence Day. Dada, who laid down his life for the country on May 27 this year, valiantly fought at the treacherous Shamsabari range in North Kashmir eliminating four heavily-armed terrorists who had infiltrated into North Kashmir from Pak-occupied-Kashmir. Taking the enemy head-on, Dada charged at the spot where terrorists were holed up and killed two terrorists on the spot and later the third one after a hand-to-hand scuffle as they slid down the hill towards the Line of Control. A fourth terrorist was also killed by him. Dada was badly injured in the encounter as the terrorists who crossed over from PoK had a slight height advantage. He displayed raw courage, unflinching grit, presence of mind and with utter disregard to his personal safety and despite bleeding profusely, discharged his duties and made supreme sacrifice for the nation.